Earlier this month, Vitacost alerted me that August is National Coffee Month! I was so overwhelmed with gratitude when so many of you made my Iced Tahini Mocha a few months ago, so I’m excited to share another coffee recipe with you. Last summer, I got hooked on drinking homemade iced lattes – more specifically, ones made with fresh hazelnut milk. I absolutely love making homemade nut milks, but my all time favorite is hazelnut – nothing better than Oregon hazelnuts! I never intended to share this recipe because it is so insanely simple, but then when I created the toffee sauce to go with it, I knew I had to write a quick post. Soak the hazelnuts overnight. Rinse and put them in a high-speed blender with 3.5 – 4 cups of water. Use less water if you want a thicker, creamier milk. I don’t sweeten my nut milks because I never know what I’ll be using them for. Blend until smooth; approximately 2-3 minutes. Strain through a nut milk bag and refrigerate. I store mine in tall glass Mason jars. Should stay fresh for 3-4 days. *can also use a coffee alternative such as Dandy Blend or Teeccino. In a large measuring cup or pitcher, combine the cold coffee and hazelnut milk. If you want a sweeter latte, mix in some coconut sugar or maple syrup. If you’re looking for a stronger coffee flavor, use less milk. Remove the glasses from the freezer and fill with desired amount of ice. We filled the glasses halfway with ice cubes. Pour coffee/hazelnut milk mixture over the ice. 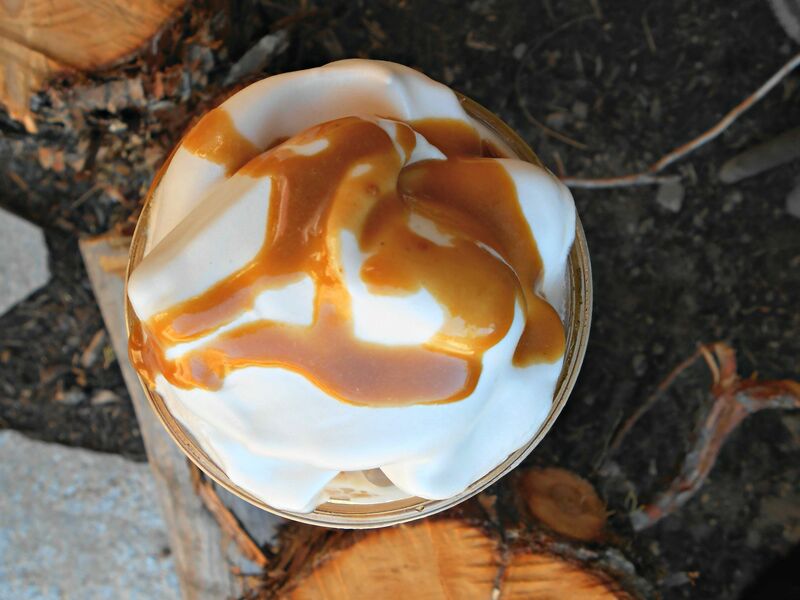 Top with dairy-free whipped cream and extra toffee sauce (optional). 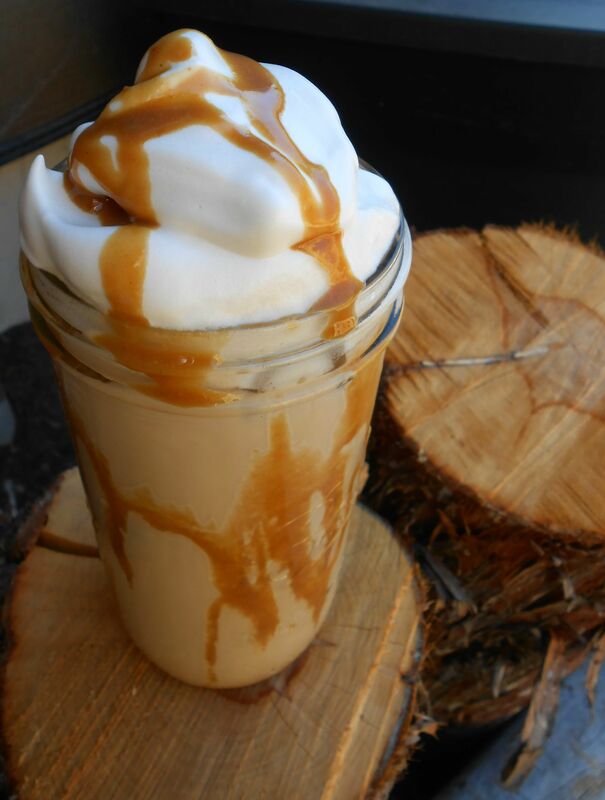 **You can skip this step and simply blend the latte with your desired amount of toffee sauce. I experimented with making homemade whipped cream using the magical Aquafaba! I took the brine from one can of chickpeas (garbanzos) and using my stand-up mixer, I used the whisk to mix for several minutes until it began to thicken. Then I slowly added in a mixture of powdered coconut sugar, maple syrup and a bit of vanilla extract. Mix until it resembles whipped cream! It makes A LOT and sadly, does not store very well – it separates. There are several recipes online with exact measurements with probably more success! You could also use homemade coconut whipped cream or store bought. If you make this, please let me know what you think! And if you’re on Instagram, please tag me (@be.sol.ful) so I can see your creation! Oh, my! You are way too kind!!! Thank you ❤ I don't make homemade nut milks as often as I'd like, mostly because we plow through them so fast, but homemade hazelnut milk is so dreamy, creamy and perfect in a latte. Thank you, again, Natalie!! Well lookee here! I have some toffee sauce leftover from making your Chocolate Toffee Oats this morning (made a double batch of the sauce hehe!) so I think I may just have to whip up some hazelnut milk and get this party started! And Natalie is right, you are an epic drizzler! After I make the sauce, this is what I’m heading for next!! !